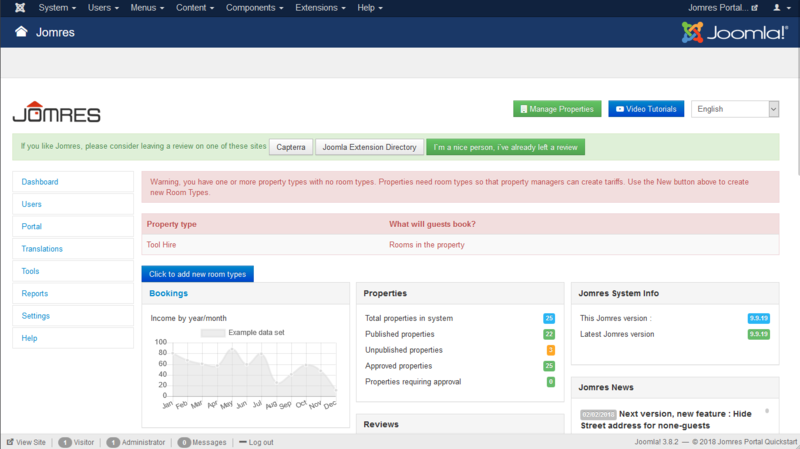 The Control Panel is the default landing page when accessing Jomres. It's important to remind you at this point that all property management is performed via the frontend of the site. The administrator area only provides functionality that is specific to site managers like setting commission rates etc. If your site is set to Developer mode then you may see an option at the top left of the page offering you a button to remove any files that have been made obsolete during an upgrade, however if the site is set to Production then this is done automatically for you. To the left is a sidebar with all available administrator functions. If you see a badge like the one in this image, that means that there are items needing your attention on that page. The rest of the space is taken up with news pulled direct from the Jomres updates server and some basic system checks.